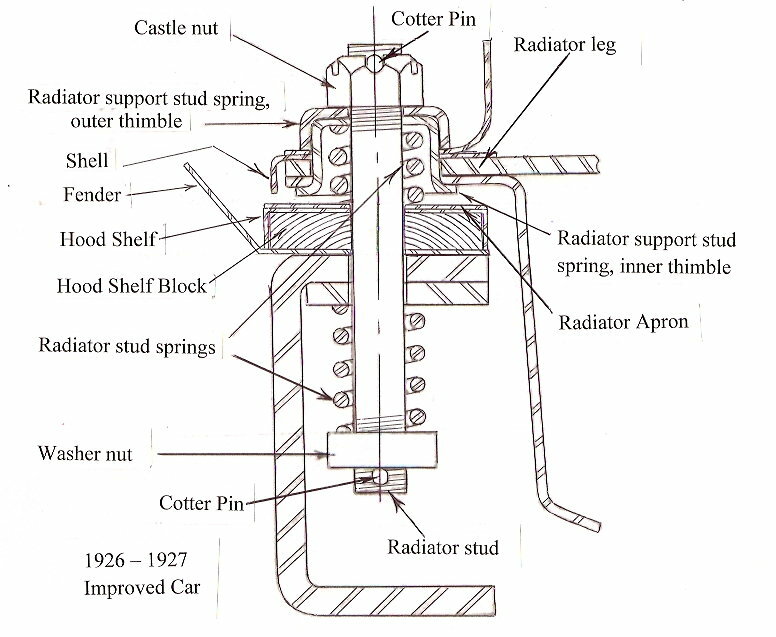 Model T Ford Forum: Radiator mounting studs? 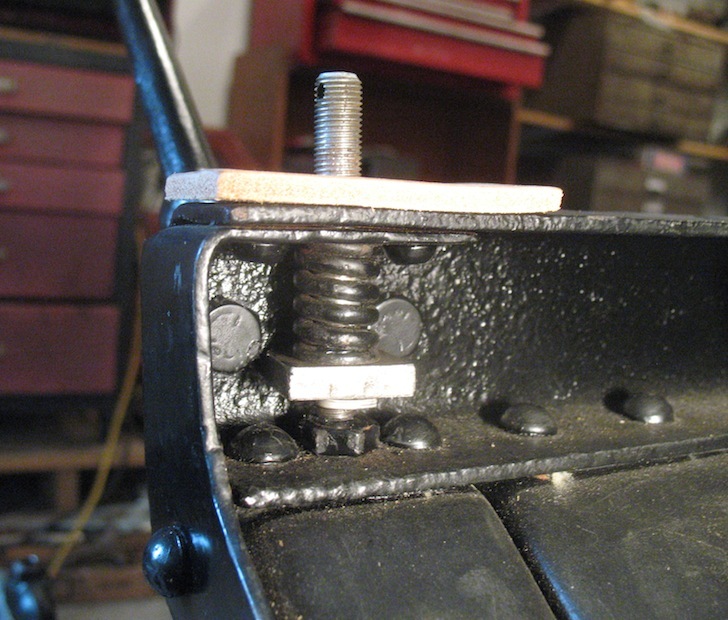 Model T Ford Forum: Forum 2014: Radiator mounting studs? If there was no cotter pin hole in the stud, most likely was replaced in the past with either a manifold stud or a valve cover stud. '26 '27 studs are the longest and I only run the castle nut on far enough to install the cotter pin. Make sure you're starting with the right stuff. 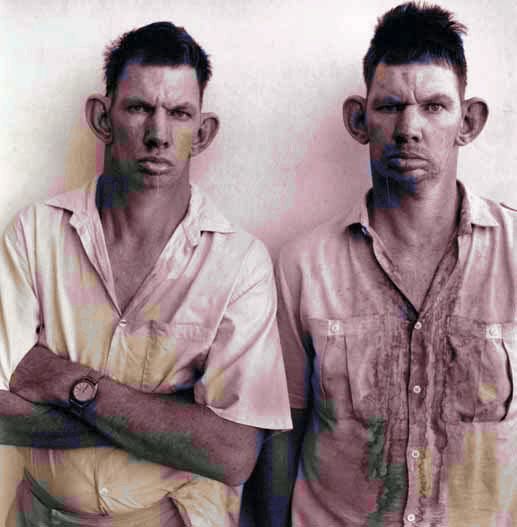 Looks like dumb and dumber to me! 1930's-40's style! What is a " washer nut"? I got a radiator stud set from Lang's and it came with a flat piece of steel with a threaded hole in the middle, is that the washer nut? Thanks. Cut wedges from wood and place these wedges under the radiator studs flat threaded bar. When using new parts it was the only way I could get the castellated nuts started on the studs. Ed, that flat bar is the washer nut. This image has been shared many times, but here it is again. Ed S. - YES that is the washer nut. The above picture doesn't show it but the washer nut is way way longer than it is wide so that it will hit the frame when you turn it since there is no way to get a wrench down there when you tighten the top nut. Here's a stud with washer nut installed. I like the idea of shoving a wedge under the stud so it doesn't turn when you put on the castle nut. Steve's picture is not what they used during 26/27. Up to 10/23/25 the washer nuts were 3/4" x 1" with a few small changes to the threaded hole location but for 26/27 the washer nut was 2-1/8" long x 3/4" so much longer and it hit the frame when you turned it so you didn't have to worry about it spinning down there when you turned the castle nut. OK now I see, so I need to trim the washer nut down in length like Steve's photo. Steve, is the nut and bolt that pushes up on the bottom of the stud temporary? And removed after the radiator is installed? The more I look at Steve's photo, the more it looks like the head of a bolt going down through the frame. Is there supposed to be a bolt for something? You do not need to shorten the washer nut. The long one works fine. In fact the longer washer nut keeps the assembly from turning when you tighten the top nut. With the springs supplied in the kits, you do need to wedge up (put blocks under) the stud so you can start the castellated nut. Once the nut is started, the temporary blocks are easily removed. 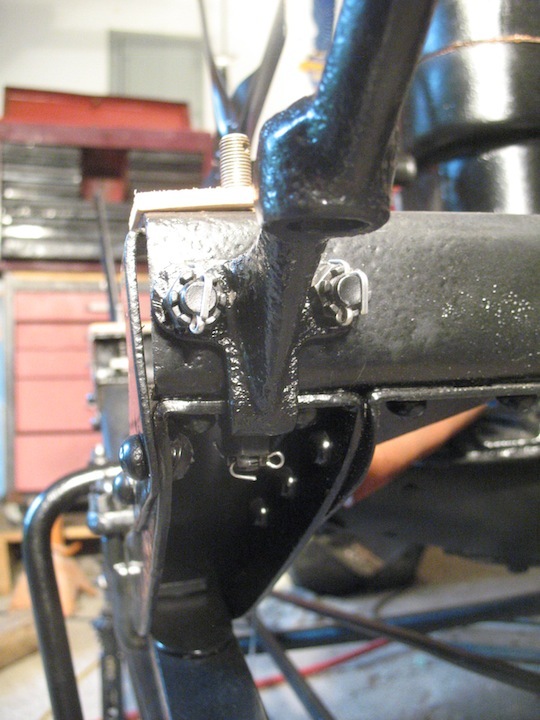 That lower bolt hex head riding on the lower frame rail is the under side fastener for the fender/headlamp bracket attached to the frame. The diagram posted by John Zibell is correct. The long flat nut goes under the frame. There is a spring between the frame and that nut. Here is how I find works very well to install the radiator on a 26-27. I put the spring and flat nut under the frame and install and bend the cotter key. Then I loosen the stud as far as it will go till the cotter key is against the washer. Then I put on the spring and thimbles on the top without the radiator and draw them up as tight as the threads will permit That will compress the springs. Then put a block of wood or metal tool, anything in the frame channel to hold that bottom nut up. Next take off the top nut and leave the spring and lower thimble in place. Install the radiator and the upper thimble. You should have enough threads to install the top nut. Tighten it and put in the cotter key. Don't bend the key yet. Remove the wood or metal out of the frame channel. Adjust the tension on the two sides to center the radiator so that the hood fits correctly and install the cotter keys and bend them. What Steve is showing is for an earlier model. The 26-27 uses two springs on each stud and has longer studs than the earlier cars. Thanks again for the pictures Steve. On my express the bolts are reversed and the nuts and cotter pin are on the inside of the frame and do not allow the washer nut to be installed with the spring. Now I have something else to correct. This has been a great post.